Articles by "Whitney Houston Songs"
Houston was signed to Clive Davis' Arista Records. Davis is a legendary record executive known for his ability to develop artists. He plays a big part in deciding what songs his artists record, and they often become huge hits. Before signing Houston, he worked with Barry Manilow, Billy Joel, Chicago and many others. In 1999, he engineered Santana's comeback. He also nurtured the career of Alicia Keys, who he signed to his new label, J Records. Billy Steinberg and Tom Kelly wrote this song. They are a very successful songwriting team, and have written hits for Cyndi Lauper, The Pretenders, Heart, the Bangles, Madonna and The Divinyls. Says Steinberg, "A lot of songwriters get together and the first question they ask each other is, 'Who do you want to write for?' Tom and I had never done that because I find it restricting and we both like to write a song for the song's sake and not try to aim at a particular recording artist. In the case of 'So Emotional,' Tom and I had a regular dialogue with Clive Davis and he advised us that he was looking for an up tempo song for Whitney Houston, so we really tried to write for that." Steinberg: "We were both big fans of Prince. If you were to hear the demo of 'So Emotional,' you would hear that it sounds quite a bit like Prince. We did the demo and Clive really loved it. When he presented it to Narada Michael Walden to produce it, he changed it completely from the sound of our demo. I don't think anyone would ever hear Whitney's version of the song and hear anything Prince-like about the production. Originally our demo had a certain Prince feel to it, in the verse in particular." This was one of 7 consecutive singles Houston released that hit #1 in the US. No one else has done that. 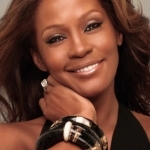 Says Steinberg: "At that point in time, Clive was just looking for great Pop material for Whitney. He didn't care where he got the songs from and she sang the hell out of them. Later in her career they became very self-conscious about who she was. They wanted to make her sound more urban and give her more urban cred, they would have avoided songs like 'So Emotional' or 'I Want to Dance With Somebody.' In a way it's a shame because Whitney really delivered those songs and she delivered ballads very well like 'I Will Always Love You.' She could sing anything, but there was pressure to show that she could sing the Hip Hop with the best of them. There's a long history in the world of Pop singers like the Drifters. The Drifters sang these great Pop songs like 'Up On The Roof,' 'There Goes My Baby,' 'Under the Boardwalk' or 'On Broadway' - those were great Drifters songs. The idea of a great black singer singing a great Pop song yet bringing something extra to it that a white singer couldn't provide, that's a great thing in music and I think that's what was going on with the early Whitney career. The same thing happened with Deborah Cox, an unbelievably gifted singer. She was also signed to Clive Davis at Arista and she's a very beautiful, very elegant woman from Montreal. I did some work with her and they had that same concern with her. They didn't want to make her sound like a Pop singer, they had to hunt for some kind of urban credibility for her. I think some singers just sing the Pop really well and it's a shame that they just can't sing it. I think Clive recognized that Whitney singing big Pop ballads wouldn't get on the big Pop charts, that it would only be successful on Adult Contemporary, and Clive's never satisfied with just getting on Adult Contemporary. He's a visionary and he realized for her to have continuing credibility, it would have to move beyond that, and where would that be? Well, it's the era of Hip Hop, so that's the direction they had to pursue. If anything, it was unfortunate as a songwriter because it takes that artist away from me. The kind of songs that I can deliver weren't wanted any more by Whitney Houston." This stayed at #1 US for 14 weeks, a record at the time. In 1995, this record was broken by "One Sweet Day" by Mariah Carey and Boyz II Men, which held the top spot for 16 weeks. The song returned to the top ten of the Billboard Hot 100 singles chart following Houston's death. Its comeback was fueled by an enormous resurgence in digital sales in the week after her passing of 195,000, an increase of 6723%, according to Nielsen SoundScan. The song was performed by Amber Riley on the 'Heart' episode of Glee. The tape of the show was delivered to the Fox network the day before the untimely death of Whitney and broadcast four days after her passing. Riley's character Mercedes sings the ballad as part of a plot line revolving around her indecision over two romantic interests.